Bigfoot still to this day, remains largely an enduring mystery and a mythical creature of folklore and tribal legends. The notorious Patterson film (PGF) depicts a short shaky, grainy footage motion picture of a so called “female Bigfoot” (Named Patty by Bigfoot Researchers) which was sighted and filmed by Roger Patterson and Robert Gimlin in 1967. Even though Bigfoot was spotted various times before by others, the Patterson film was truly the genesis of true Bigfoot/Sasquatch lore and the infamous Bigfoot costume. Other sightings date back as far back as 1926 and some even claiming that they had original recordings of the Bigfoot. Many scientists have claimed that the Bigfoot is a just a grand elaborate hoax while other scientists have depicted that the Bigfoot is possibly an unknown bipedal creature to science. In addition there are some experts that have stated that it cannot be a Bigfoot costume/monkey suit as it is impossible for any human to imitate the Bigfoot’s muscle and gait movements. Throughout the years in fact, various people have come forth to claim to be the man in the “Bigfoot costume” However it is still highly debatable to many if the so called Bigfoot “man” in the film was wearing an ape suit, though Roger Patterson died swearing that his Bigfoot footage was authentic. Patterson and his partner at the time (Robert Gimlin) swear that they witnessed a large ape like animal which was unknown to science. 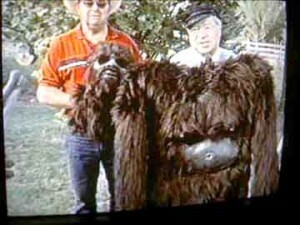 To date no film maker has been able to reproduce a costume resembling the Bigfoot which was depicted in Patterson’s and Gimlin’s encounter according to PGF believers. How Bigfoot came about was when Patterson and Gimlin were out on horseback at Bluff Creek and encountered a huge overturned tree and then spotted the figure hiding beside the creek which was an estimated 7.6 meters tall. At that point the horses spooked and reared up, Patterson followed the creature and managed to get the incredibly rare fifty three seconds of footage on camera. Patterson claimed that he managed to get within 24 meters of the Bigfoot. The ape like creature appeared from behind a grove of trees and when Patterson tried to get a closer shot the Bigfoot disappeared into the wildness, out of reach. Bob Heironimus a friend of Roger Patterson claims to have been the figure depicted in the Patterson film. Bob Heironimus was supposed to be paid by Roger Patterson about $1000 to betray what appears to be a female Bigfoot. Bob has been also tested against a lie detector and passed it which he stated he wore a Bigfoot costume for the infamous PGF film. For the most part Bob has stayed away from the Bigfoot media and simply said where he’s from everyone knows he was the Bigfoot. In a nutshell he basically says he was hired to do a job by Roger Patterson to portray a Bigfoot and then was refused payment. Hence he decided to tell his story and his involvement in the Roger Patterson Bigfoot film. Roger Patterson estimated the subject in their (Patterson-Gimlin Film) footage, as being between 6.5 to 7.5-feet tall (possibly 7-feet 6-inches)… Not, “an estimated 7.6 meters tall”, as you wrote… the PGF subject is supposed to be Bigfoot, not King Kong, silly! Very interesting story and an even bigger mystery… Is Bigfoot Real? We may never know… Roger Patterson died a little over four years after the date that he and Robert Gimlin filmed their encounter with the creature they claimed was a real Bigfoot. Regardless, whether the creature in the Patterson-Gimlin Film is a real Bigfoot or an elaborate hoax, it is important that we share the facts and details as accurately as possible… The PGF is about Bigfoot, not King Kong.